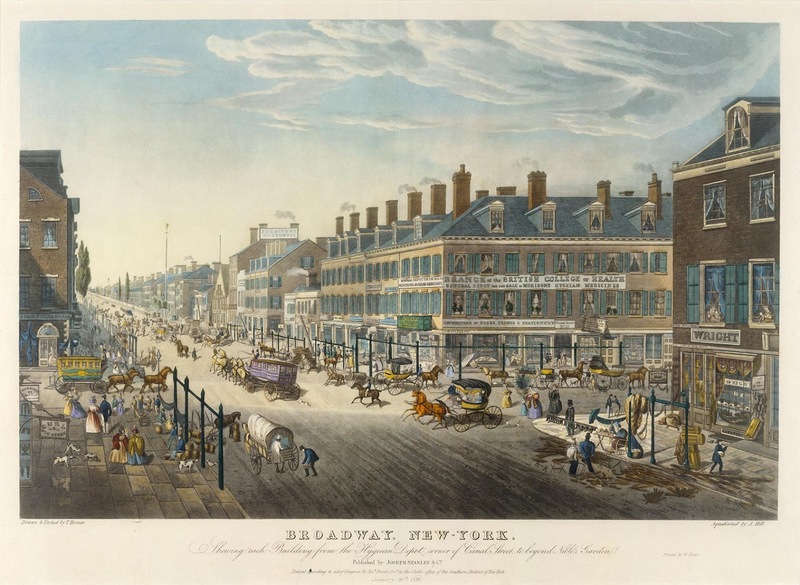 "Swallowed up in a moving mass;" New York City traffic at Broadway and Canal Street in 1836, by Thomas Hornor. (www.metmuseum.org) For a detailed analysis of this image, see here. We get into a cab, a one-horse cab entered from the rear, and of a fashion now quite departed. It teters forward and back; it rocks and rolls from side to side; it stops; it crawls; now it darts furiously ahead; now it crawls again, swallowed up in a moving mass all about of boxes, barrels and crates. I hear cries, shouts and profane language. Drivers on one side shout; on the other side yell; behind they curse; our cabman swears back. Once more we move; we rush, teter, rock and bang over the cobble-stones round a corner; we stop; my parents get out. I am told to remain behind, and placed in temporary charge of the cabman. I wonder this cabman shows no signs of the recent disturbance through which he has passed. He yelled, shouted and swore as loudly as the rest. He seems to have forgotten all about it. I should think he would talk about it for the next two months. We would at Pennyville. 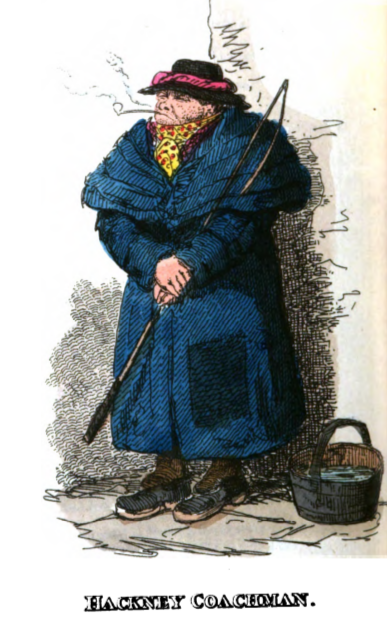 He is a tall, wrinkled, sharp-nosed old man, clad in a long snuffy-looking coat which runs largely to collar. Above, he seems all coat-collar and hat. My parents have entered a carpet-store. Rolls of carpet stand without, from some of which the bright-colored threads have raveled and lie loose on the pavement. I am quickly employed in winding balls of this thread to carry back to Pennyville. Absorbed for some time in such occupation, I am surprised and pleased as the cabman tosses toward me a large ball which he has wound also. He does but stand there, tall, lank, snuffy, and buried in coat-collar and hat. He never knew the incredible remembrance this one act brought him. He is the first and only human being in all this hard, cold, unsympathizing great city who has shown a trace of friendship for me.